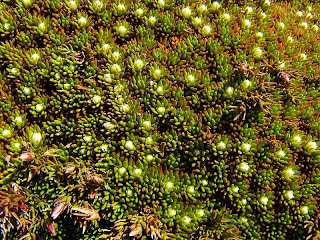 Leptecophylla juniperina, the Mountain Pinkberry. This species was previously a Cyathodes, and seems to have been formed by classifying C. parvifolia and C. juniperina together. They now form two sub-species, (parvifolia and juniperina) and I'm not clear how to tell those apart. 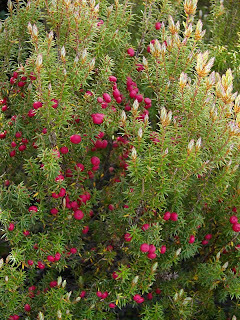 Subspecies parvifolia appears to be more likely on mountains and juniperina on coastal heaths, but my book is ambiguous about those habitats. However, based on the size of the leaves and fruit, I think this L. juniperina subsp. 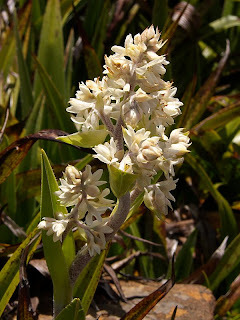 parvifolia. Milligania densiflora, the Silky or Common Milligania. Thes plants have some similarity to Astelia alpina, the Pineapple Grass, and I think that sometimes when people refer to Pineapple Grass, they have seen Milligania. There are several species of Milligania, and I'm not entirely sure how to tell them apart when they're not flowering. The colour of the leaf surfaces seems to be the key, but I'll have to see what the difference really is between green and blue-green. Donatia novae-zelandiae, the Western Cushion Plant. In the 4th edition of "Flowers and Plants of Tasmania" (Launceston Field Naturalists Club) it appears to me that the photograph of this species has been confused with that of Dracophyllum minimum, which will confuse some people. The flowers appear to be the most obvious distinguishing feature. 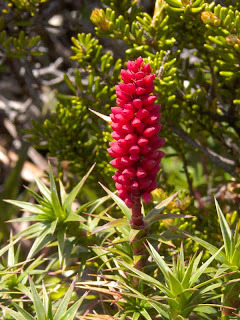 Richea scoparia, known simply as Scoparia, or sometimes #@#!%& Scoparia. This was the only reasonably intact flower I saw, most others having shrivelled already. Telopea truncata. 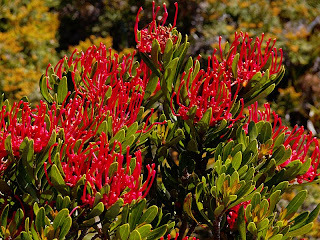 There were still Waratah bushes at Hartz last weekend with flowers on them, although most had finished.